DUBLIN (CNS) — An Irish missionary sister said she will use prize money raised by schoolchildren to help buy medicine for the Loreto Sisters’ health clinic in South Sudan, where 10 percent of babies die before they are 3 months old. 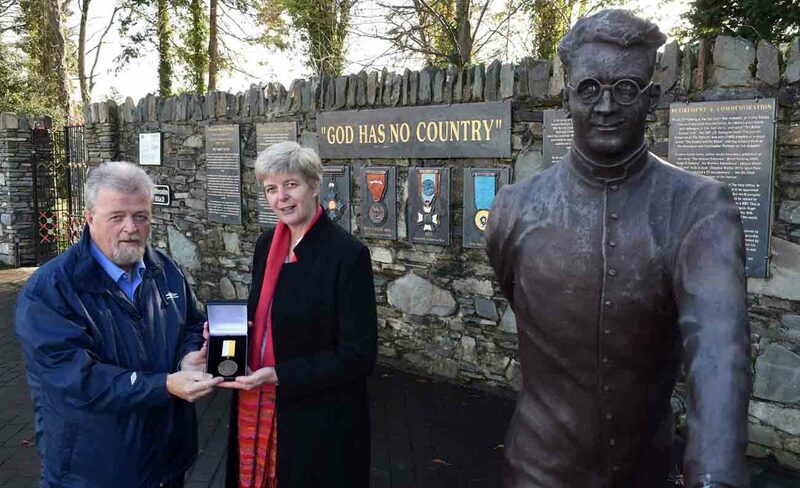 Loreto Sister Orla Treacy was awarded the 2017 Hugh O’Flaherty International Humanitarian Award, which commemorates the Irish priest’s role in saving more than 6,000 Jews and Allied personnel in World War II. This year, for the first time this year, the award was accompanied by a prize of 1,000 euros, (US$1,158), raised by students in Killarney. Speaking to Catholic News Service in Dublin before returning to South Sudan, Sister Treacy said the money would go toward providing medicine for the Loreto clinic in Rumbek. “Our biggest killers are malaria and also hunger-related — malnourished babies, anemia and infections. We need malaria medicine, iron tablets, vitamins and antibiotics,” she said. Due to the precarious state of the country, the health infrastructure is minimal. Many hospitals are no longer accessible by road due to the fighting. Sister Treacy told CNS how in Rumbek, “if you go to the government hospital, they usually tell you to bring your own diesel, because if you want to get an X-ray or if you need an operation, they won’t have the diesel for the generator.” Medical personnel struggle to get paid, she said. She said the country tops the polls in all the wrong areas. Just 1 percent of girls finish secondary school. Literacy rates are the lowest in the world — just 27 percent of the population is literate, and that is in urban centers, not rural places like Rumbek. Forced marriages of teenage girls, prized for their cattle dowries, are common and result in up to 52 percent of girls being married by age 18. The economy collapsed in the wake of the civil conflict that erupted in 2013. Almost 90 percent of the population is unemployed, and the landlocked country has about 125 miles of paved roads in a country 10 times the size of Ireland. “The people know more of the experience of war than they do of peace. This is our reality,” she said. Sister Treacy said Catholic religious are making a difference. The Loreto Sisters educate 1,200 young people each day, offer employment to 200 local families and provide 2,000 meals each day. She told how one 20-year-old illiterate woman, Kana, who began bringing her brother to their primary school, now works at the Loreto clinic in the morning and is attending adult education classes in the afternoon. “She is a symbol of hope to us. Every day she is learning something, and every day she is making a contribution,” she said. “All we can do is meet every day as a new day and every week as a new week — you just live in the hope that every day you will be able to continue to do what you can do,” she said.